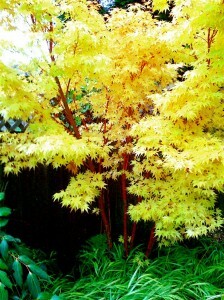 One of the challenges of creating a great garden is to get great color and foliage throughout the year. Most plants peak during a certain season and then fade into the background of the garden. Few plants can offer more than one or two seasons of interest. One of my favorite ornamental trees , the Coral Bark Maple (Acer palmatum “Sango Kaku”) breaks all the rules and looks incredible for 4 seasons of the year. This japanese maple is a small tree that is prized for its bark that turns coral pink in cold weather. But the interest isn’t limited to just the winter. 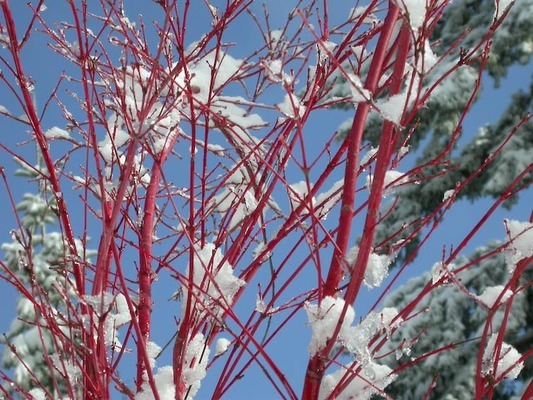 This tree will add color and interest to your garden all year long. In the summer, the tree has deeply cut green leaves typical of other japanese maples. It has an elegant vase shape and delicate branching. In the fall, the show really starts. The fall foliage is a striking bright yellow sometimes mixed with orange. As the autumn progresses, the bark starts to turn its trademark coral pink color making the tree appear to glow. In the winter, the bark color intensifies with the cold and almost becomes flourescent. The color really pops when there’s snow on the ground. 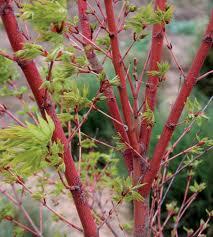 In the spring, new leaves emerge as a bright lime green and make a great contrast with the coral bark. As the spring progresses, the bark eventually loses it’s pink color and the leaves fade to their summer green. It’s a small, moderately growing tree that reaches about 20-25 feet at maturity. It is considered hardy to USDA zone 6. It likes part shade and makes a great specimen plant in a part of the yard where it can really be put on display. The bark turns coral pink in the cold weather and is gray during the warm months. 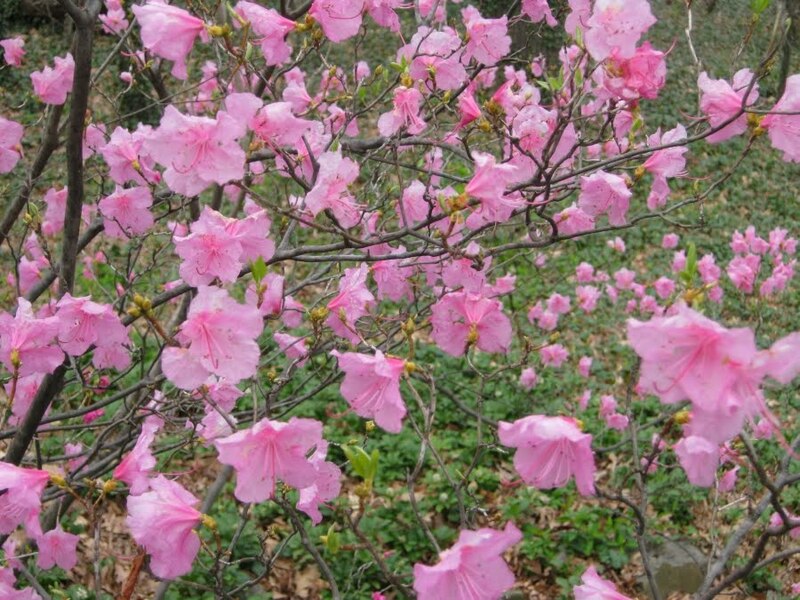 The main trunk and older branches will tend to lose their pink color with age, so prune it regularly to promote new more colorful growth. Keep it out of the hot afternoon sun. Since it’s not a fast grower, be sure to chose a specimen that has a nice shape and lots of young branches. 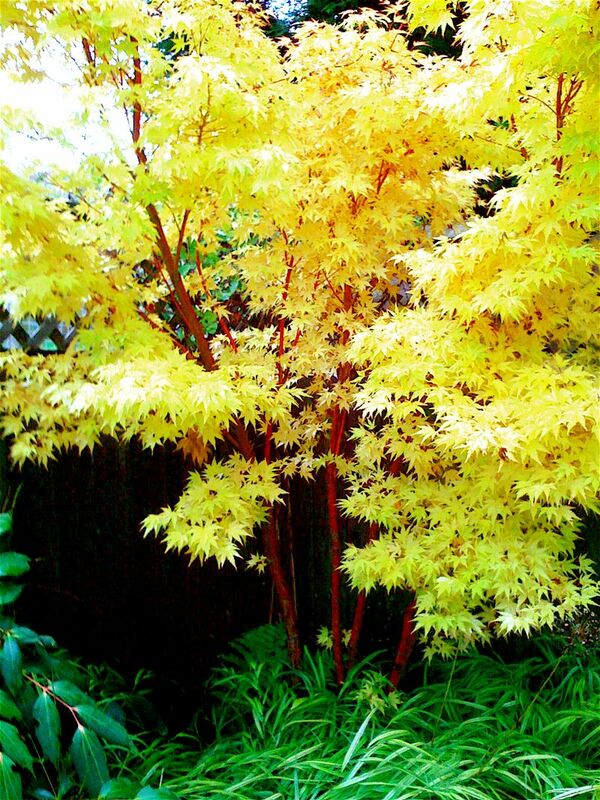 The Coral Bark Maple is one of the best specimen trees for year long interest. If you see it in the nursery in spring or fall, it’ll be hard to resist getting one for your garden. If your garden looks anything like mine in the winter, it can get downright depressing. By late February, we’ve had it with winter and the spring bulbs are still a month away. 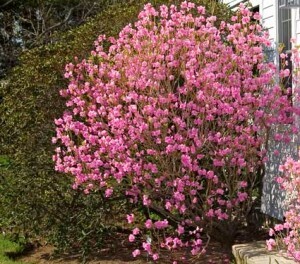 Most “early” spring blooming trees and shrubs are even longer…..six to eight weeks away. How would you like to get some color in your garden in February and March? 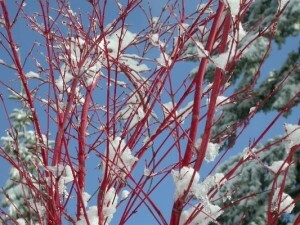 Most homeowners aren’t aware that there are several varieties of perennials and shrubs that bloom in the winter. 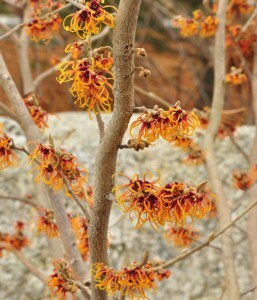 Today we’re going to talk about one of my favorites…witch hazel or hamamelis (hæməˈmiːlɪs). Hamamelis is a genus of a handful of species, some native to North America and others to Asia. Most are large shrubs that can get to 10 or 2o feet at maturity. What makes witch hazel so interesting is that it blooms with spectacular yellow, orange or red flowers in winter, when little else is blooming. The most common species used in the garden are Hamamelis virginiana and the Hamamelis X intermedia hybrids. Hamamelis virginiana blooms in the late fall and is not as widely used as some of the intermedia hybrids. 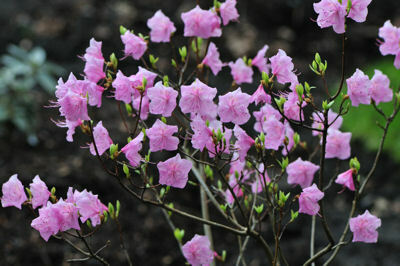 These hybrids generally bloom in February and March and give an amazing display for up to two months. Some cultivars are even heavily fragrant. So, why doesn’t everyone have witch hazel in their garden? Like other winter bloomers, most retail nurseries don’t carry them because they are only in bloom when the nurseries are closed. If they are for sale, most homeowners will pass them by because they never get to see them in bloom. Those who do go out of their way for one of these beauties are rarely disappointed. If you want to get winter flowers, you have to be resourceful enough to find a nursery that carries witch hazel and buy it when it looks its most boring. Here are some of the better cultivars to look for. They are usually found at larger garden centers. 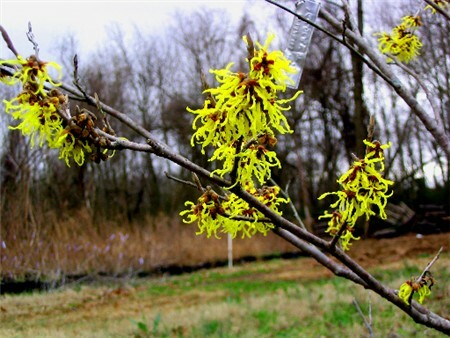 “Arnold’s Promise” has a fragrant yellow flower in late February and March. It’s a slow grower to about 10-20 feet high and wide. “Jelena” has fragrant burnt orange flowers in February. A slow grower to 10 -15 feet high and wide. “Diane” has a fragrant red flower in late February and March. It’s a slow grower to about 10-20 feet high and wide. Witch hazels like full sun, but also do well on woodland edges and make a great transition from garden or lawn to woodland. Let us know if you have one! Garden Design for Living is HERE! We’re launching Garden Design for Living, an exciting new site for homeowners, landscapers and gardeners. Our site is still under construction, but soon we’ll be launching tools and tips to help you design and build the landscape of your dreams! 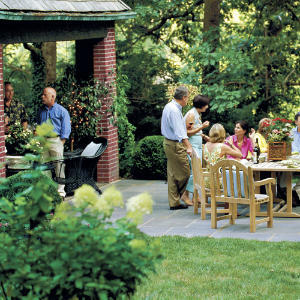 You don’t need to have a degree in landscape design to create your own amazing outdoor living spaces. We’ll walk you through every step! Check back soon. We’ll be adding content all winter! In the meantime, start exploring our site….